Of the many works of Dr. Seuss, the most iconic has to be How the Grinch Stole Christmas (sorry, Cat in the Hat). Not only is it the most famous of Dr. Seuss’ books, but in American culture it has become synonymous with the Christmas holiday. Its 1966 television adaptation has become a tradition of the holiday season, and the titular character – despite being a curmudgeon who disdains the merry holiday – has become almost as associated with Christmas as Santa Claus himself. This 2018 animated film by Illumination is the second feature length, theatrical adaptation of the classic tale, following the 2000 live-action film starring Jim Carrey (which, despite its muddy critical reception, has become a nostalgic favorite for many, myself included). How well does Illumination’s take on Dr. Seuss’ classic stack up against its predecessors? Well, in short, it’s a pretty good adaptation. But it’s also an incredibly safe one, as it doesn’t really add anything new to the timeless tale. The key ingredients remain the same: The Grinch is a lonesome creature who despises Christmas. He lives on Mt. Crumpit with the only creature who could love a curmudgeon like himself, his dog. The Grinch’s ire for Christmas is magnified by the fact that his mountain home looks down on Whoville, a happy town obsessed with Christmas. Tired of hearing the joy of others below him, the Grinch sets out to ‘steal Christmas’ by dressing as jolly old Saint Nick and stealing every last present and decoration in Whoville. The plot is simple and timeless, so a direct retelling isn’t any unforgivable sin, but it does mean that Illumination’s film does suffer a bit from a lack of its own identity. There is, however, one notable change that clashes with the message of the story. In Dr. Seuss’ original book and the TV special, the Grinch is simply a cold-hearted individual, unable to love anything but his dog. His reasons for hating Christmas never needed a backstory, but it’s implied that he sees Christmas as a shallow celebration of gifts and loud noise. 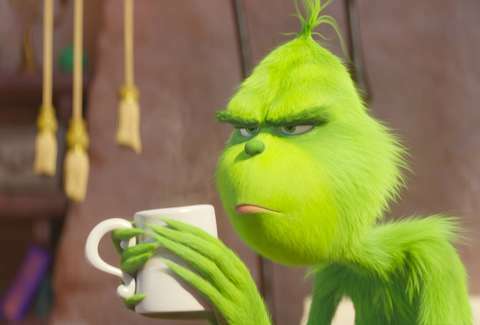 But the Illumination film, like the 2000 live-action Jim Carrey vehicle, gives the Grinch a backstory to justify his grouchy disposition. It’s understandable that the filmmakers would want to flesh out the story a bit to justify its presence as a feature film, but there’s something about this Grinch origin story that feels misplaced. In the 2000 film, it was being bullied by the kids of Whoville that lead to the Grinch’s self-imposed exile. And since Whoville loved Christmas, he loathed it. Although its execution didn’t always work (he’s upset because kids made fun of him for cutting himself shaving? Really? ), it still made sense given the narrative was that his anger and disdain were misplaced by being targeted at Christmas. But here in the Illumination film, the Grinch (voiced brilliantly by Benedict Cumberbatch) was an orphan who grew up alone. 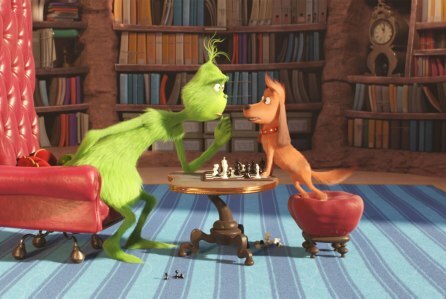 His loneliness is no fault of his own in this depiction, and so his anger and frustration with the Whos and Christmas comes across as more of inner confusion and insecurity than it does a man who has grown bitter. So this version of the Grinch doesn’t really seem to have a heart that’s two sizes too small (even though that iconic element remains). He’s more sad and in need of a hug than he is bitter and in need of a change of heart. So the Grinch’s backstory is a little misplaced, given the message of the original story that carries over here. Still, the film is a lot of fun. Illumination has never been a heavy hitter with animated storytelling in the ways that Pixar or Disney are, but they do excel and delivering high energy cartoon antics. And that’s as true here as ever. The many gadgets and gizmos the Grinch utilizes to carry out his Christmas-stealing schemes are fun to see in action, and the characters frequently lead to some zany comedy. And in typical Illumination fashion, the animation is colorful and lively. For an animation studio that’s known for making ‘smaller’ films in terms of budget and recourses when compared to other animation studios, you’d never know it with how fun their films are to look at. The Grinch just oozes a visual charm that captures the Dr. Seuss look in a way the live-action film simply couldn’t. Like in the live-action feature, Cindy Lou Who (Cameron Seely) is promoted to a main character, who is determined to ‘trap’ Santa so she can ask him for something too important to be written in a letter, to help her mom be happy. And Whoville now houses a man named Bricklebaum (Kenan Thompson), who is not only the antithesis of the Grinch (always jolly, loves Christmas), but also the closest thing the Grinch has to a neighbor, as his house sits at the foot of Mt. Crumpit. Cindy Lou helps add a bit of heart to the film, while Bricklebaum provides some of the biggest laughs. One of the film’s biggest highlights is Benedict Cumberbatch’s aforementioned voice work as the Grinch. Big name celebrities often phone-in vocal work for animation, and seem like little more than a means to help advertise the film. But Benedict Cumberbatch goes all out by creating a ‘Grinch voice’ that’s unrecognizable as the actor. To have a big name actor care that much for voiceover work is always welcome. 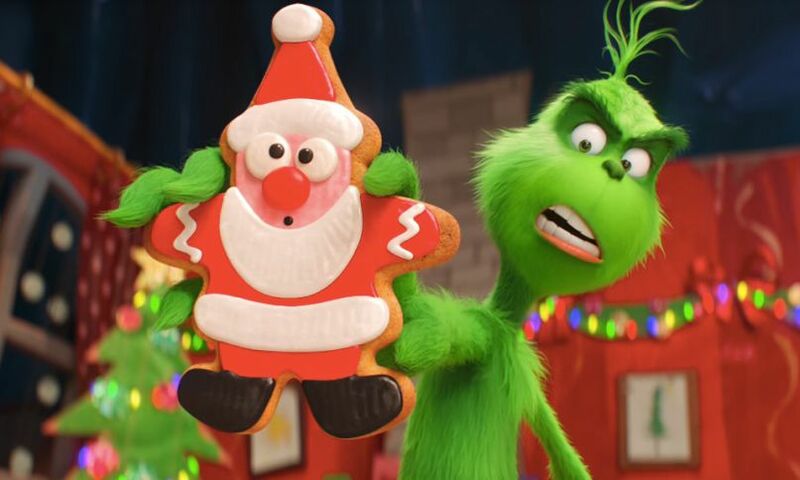 Illumination’s The Grinch may not quite capture the purity of Dr. Seuss’ original book or the classic TV special, and the Grinch’s new backstory may somewhat contradict his supposed status as a curmudgeon, but it’s still a fun take on the iconic tale that should delight younger audiences, and maybe even some older ones as well.